Last Month, Berman & Wright, Architecture, Engineering & Planning, LLC compared the costs of having similar buildings Leadership in Energy and Environmental Design (LEED) certified through the Unites States Green Building Council (USGBC) and Green Globes certified through the Green Building Initiative (GBI). They left you with questions regarding the design documentation and submission fees for LEED and Green Globes and how that may impact the building. 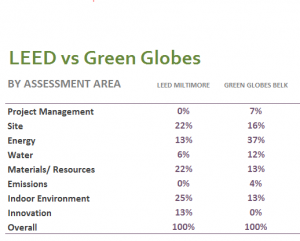 The LEED process is changing, but it has historically been lonely. The designer is left to work through the required information, make assumptions about how to get credits, and turn in reviews periodically to the USGBC. The Green Globes Process is hands-on. Their personnel are ready and willing to help the designer every step of the way. For LEED Certification, there is an established format for submittal of each credit. And, for the two buildings we have been comparing (LEED Certified Miltimore Hall (at 172,000 square feet, and with a Guaranteed Maximum Price [GMP] of $32,000,000) and Green Globes Certified Belk Hall (at 168,000 square feet, and with a GMP of $27,000,000 – both at the University of North Carolina [UNC] Charlotte), the LEED reviewers were not consistent, nor were their requirements. The time required to take the project documents from their usable format for construction and turn them into a LEED submission, coupled with the time required to rework the project due to declined LEED credits and to submit appeals because the LEED reviewer’s requirements had changed has proven to be substantial. GBI assigned us a reviewer for Belk Hall. That person helped us to understand what their needs were in order to assess the project. They used our design and construction documents; they didn’t require us to change the format or produce new documents. They were flexible and offered solutions for earning percentage points with the design we had. These processes are only as good as the systems that are actually constructed. No one from the USGBC looked at Miltimore Hall in person. Changes during construction could have disallowed certain credits from being achieved, however nothing was verified on site for LEED Certification. GBI sent someone to visit with our designers at the building and discuss the systems. They walked through to ascertain whether or not the systems they had approved for certification had actually been installed as designed. This verification lead to a closed loop system. They knew the building earned its Certification. LEED may seem to be more stringent, however this critical final step is the most stringent requirement – was the building constructed as Certified? It is difficult to compare the actual ratings we received, since they are documented in very different ways. LEED provides credits in sub-categories in the following overall categories: Sustainable Sites, Water Efficiency, Energy & Atmosphere, Materials & Resources, Indoor Environmental Quality, and Innovation & Design Process. Green Globes provides percentage scores in sub-categories in the following overall categories: Project Management, Site, Energy Water, Resources, Emissions, and Indoor Environment. With different categories and different credit systems, comparing credits and percentage points has proven to be ineffectual. In addition, with LEED, if a particular sub-category doesn’t apply to your project, you must take a “no” in that sub-category. Green Globes allows you to mark those sub-categories “not applicable”. For example, if your building doesn’t have any oil-fired furnaces, all questions related to oil-fired furnaces can be marked “N/A”, which changes the scale. 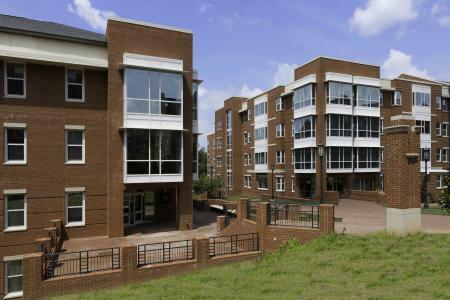 Miltimore Hall obtained its highest percentage of LEED credits in Indoor Environment, while Belk Hall obtained most of its Green Globes percentage points in Energy. A comparison of the areas in which each building excelled only provides more ambiguity as to which of the programs may be helping to provide a more sustainable outcome. Considering the up-front costs and the difficulty in comparing certification systems, some may raise the question: Why certify our building? The rating systems don’t only provide a plaque to hang on the wall in the building’s lobby. They provide a framework for better, more integrated design, where the owner and end users must be more involved during the design phases, when important decisions are made. Next month, we will provide reasons for using a LEED or Green Globes type of system, and discuss how to choose the best certification system for your project.